Made with InconTek® Technology inspired by NASA. Triple layered core draws wetness away from the skin. Four refastenable tape tabs (2 per side). Now with SpeedSorb® - absorbs liquid up to 400% faster! Superio® is our top of the line brief providing unprecedented protection. It is designed for more active use that will never tear or have pinholes despite constant movement. The white plastic backing in also quieter and does not make the usual crinkle sound other briefs make. It also features a wider core to help those with bowel incontinence as well and our NASA inspired InconTek® advanced multi-layered system. Latex free and has a re-sealable landing zone. These award winning briefs are so innovative that they were featured on Discovery Channel’s How stuff works and are designed to last up to 8 hours using NASA inspired multi layered InconTek® technology similar to designs used by astronauts in space for long missions. Unlike other briefs that have a single core absorption system, the Wellness Brief has a triple layered core just like NASA's MAG (Maximum Absorbency Garments) so that all of the moisture is retained away from the skin in a separate layer, and what is actually against the skin feels dry. Keeping urine away from the skin is the key to preventing urinary tract infections, severe irritation, and many other incontinence related problems. 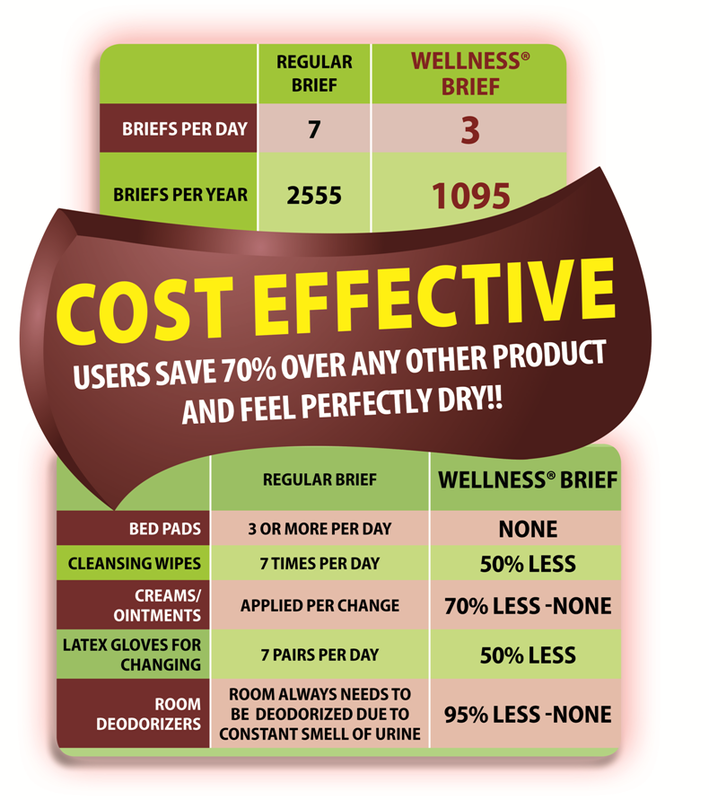 The Wellness Brief also has a unique scheduled changing system and is therefore is one of the easiest to use.This is revolutionary because changes can actually be scheduled to just once in eight hours/ three in 24 hours, putting the wearer or caregiver in control with no worry of any exposure to the effects of urine. Save up to 70% over other briefs due to fewer changes and rarely requires expensive creams or ointments.